It should be a big weekend of college football for four historically black colleges and universities in Alabama. There will be two HBCU classics to open the college football season. 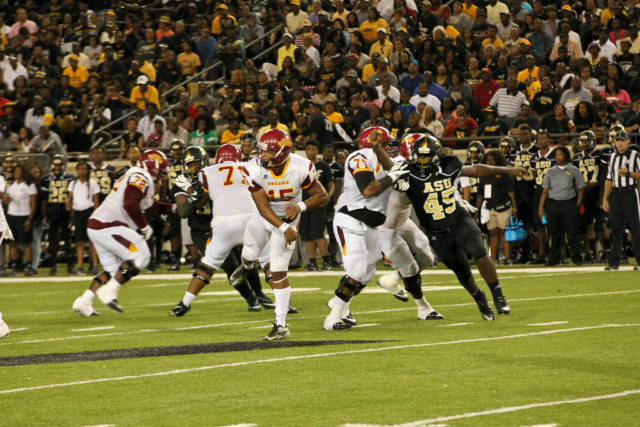 Alabama State University will host Tuskegee University in the Labor Day Classic on Saturday, Sept. 1 at 5 p.m. in Montgomery. In the other matchup later that evening, in Huntsville, Alabama Agriculture & Mechanical will entertain Miles College at 6 p.m. in the Louis Crews Classic. Tuskegee is the defending Southern Intercollegiate Athletic Conference (SIAC) champion. The Golden Tigers are the preseason pick to win the SIAC West Division title. Tuskegee is led by quarterback Jamarcus Ezell and wide receiver Javarrius Cheatham on offense. Ezell played some great football last season. He threw for 1,160 yards with seven touchdowns and five interceptions. Ezell had a big impact on the ground, too. He had 68 carries for 338 yards and two touchdowns. Cheatham is a big play receiver. He had 22 receptions for 463 yards and three touchdowns. He averaged 21.5 yards a catch. Defensively, the Golden Tigers have linebacker Davoris Thomas who was named the SIAC Preseason Defensive Player of the Year. Thomas had 80 total and 44 solo tackles with six tackles for loss and three sacks. Tuskegee head coach Willie Slater should have another good team on both sides of the ball. Alabama State finished on a high note putting together a 5-1 record down the stretch. The Hornets completed the season with an overall 5-6 record. Alabama State head coach Donald Hill-Eley has some terrific returning players. 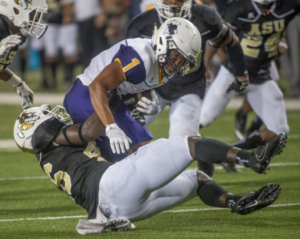 Alabama State offensive lineman Tytus Howard, a preseason second-team All-Southwestern Athletic Conference (SWAC) selection, is an outstanding pass and run blocker. Howard’s blocking skills should give the ASU offense a boost up front. Hornets’ quarterback Darryl Pearson, Jr. received preseason second-team All-SWAC honors. Pearson played 10 games as the Hornets’ field general throwing for 481 yards and four touchdowns. He was the team’s third leading rusher with 311 yards while scoring two touchdowns. On defense, Alabama State linebacker Malik Bridges is a key member of the Hornets’ linebacking corps. Bridges led the team with 47 total and 22 solo tackles. Linebacker Darron Johnson has the ability to cover a lot of ground. Johnson was the Hornets’ second leading tackler. He had 404 total and 20 solo tackles along with 6.5 tackles for loss. In the secondary, defensive back Jeffrey Hill is a great pass defender. Hill had 11 pass breakups and one interception. He has a good nose for the ball with 32 total and 23 solo tackles. Miles College running back Justin Hardy is one of the most exciting players in the SIAC. Hardy was chosen as the league’s preseason Offensive Player of the Year. He led the conference in rushing with 1,197 yards and scored an impressive 13 TDs. He opened a lot of eyes with a sensational performance against Central State when he tallied 210 yards while scoring three touchdowns. Hardy could be a handful for most teams. Miles College was picked to finish second in the SIAC West Division behind Tuskegee. In addition to Hardy, Miles head coach Reginald Ruffin had four players – Marquel Shelton, defensive lineman; Roger Womack, offensive lineman and linebacker Austin Stephens earn preseason all-conference honors. A&M first-year head coach Connell Maynor has a big time player in safety Dylan Hamliton who is a real playmaker in the secondary. Hamilton was a preseason first-team All-SWAC selection. He had 67 total and 31 solo tackles with six tackles for loss and 3.5 sacks. Up front, defensive end Vernon Moland is a great pass rusher. Moland led the team with 10 sacks and 11.5 tackles for loss. He was also named preseason first-team all-conference.